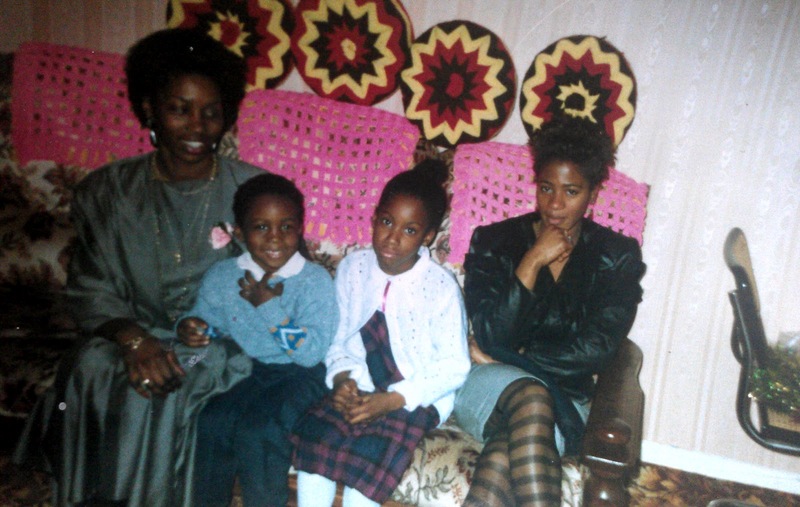 Some time in 1988: Wearing my lets go and see the family member who I have seen for years clothing and Ramona also, dressed to look like we were the perfect single mothered family. My mother dressed in clothing I had no idea she owned anything like so and her very close friends Janeta, dressed like the bad girl I knew my mother was. No, she wasn't a bad girl she, but she did like to take us to a lot of parties and get togethers that Ramona's father's side of the family like to keep. Aunt Gee and Aunt Ceecee were always having some function, whether it be for a child's birthday, their own or some marriage. Getting into the cab driving for what seemed hours and me having to be strapped in the middle of my mum and sister. My mum was always afraid of me being next to the passenger doors after that time I opened the door whilst the car was still moving. That wasn't the first time and I'm sure I had done it more time after. We all arrive at Aunt Juju's home in west London and before ringing the bell, my mother I remember clamps her hand on mine and tells me t be well behaved, "Don't touch anything and don't question her. Just show her you beautiful smile" she says to me, Janeta rubs my shoulder and Ramona nudges me. It's not that I'm a bad kid, I just get bored easily. "Hello, my lovely. Oh look at you Ramona and Rogue look how you are growing, you want a sweety?" Tall, round, plump and curly haired Aunt Juju smiles her toothy smile that scares me and hell I do want some sweets, but I have to decline politely as Mummy dearest says they make me hyperactive, whatever that's meant to mean. "No, thank you. Where the toilet is mummy?" looking around the dark house, are they trying to save on electricity? Must be. in the passage doors, so many doors leading to so many different places I am yet to venture day. My mum shows me the way and closes the door behind me. I hear laughter and Ramona's fake sweet girl voice undertone that of Janeta's rough ghetto voice replying to Uncle Michael. Uncle Michael makes me laugh he is so tall and skinny, he looks like a long piss stain on a white wall with smudges of charcoal for his beard, eyebrows and hair, dress always in shirt and jumper combinations and trousers, always grey trousers. "I'm finished!" I scream out and swing the door open just to see my mum there waiting for me like I'm some lethal prisoner she can't trust. "I told you don't start with me today" grabbing me by the shoulders she fixes my clothes and walks me to the family room. Snooker table, who the hell has a snooker table in their house? Aunt Jujube and Michael that's who and wow look at the size of that TV, I'm sure if I rock it a little bit it would fall on top of me and break something, better not then. I can smell that old black peoples smell that my Granny and Grandad's house has. Why is it that all black people have that same smell if they are from where we are from and white people's homes always smell of laundry and washing up liquid and Indian people, well you know they always smell of curry and spice, even when they're not at home the smell sticks to them like pritstick? The adults go into the kitchen leaving me and Ramona alone. "Put the TV on then, yeah?" bouncing on the doily sofa I'm pleading Ramona to crank up the entertainment. "No, mum said you can't touch anything." She says to me holding my hands on my lap in some attempt in stopping my bunny rabbit bottom bouncing. Well, okay then so I guess I'm going to have to find something else to occupy my time in this 'Tales of the Crypt' house then. Uncle Michael comes in the room holding a very craved out small glass with some brown drink in it, I did ask if I could have some but he said it was 'A big people's drink' stupid doodoo head. They all arrive back from the kitchen and the show around the house. Where am I? Why has every one stopped doing what they are doing and why are they as still and cold as ice? I'm not to sure why stand and the end of the snooker table. They are all frozen, time has stopped, I can play and prance around seeing as nobody is doing anything and then sit back down. I want to play snooker. "What has he done!" Aunt Jujube shouts out and begins chatting in Creole. Oh dear they weren't frozen after all, just observing the room and glass on the floor from the TV and inside the TV lay there the orange snooker ball I wanted to play with and am very sure I didn't get the chance to. My mum pulls me to the bedroom and the lashings begin. Oops I Bust the screen out of her TV!